Subset Games proves that they aren’t just a one-hit wonder. 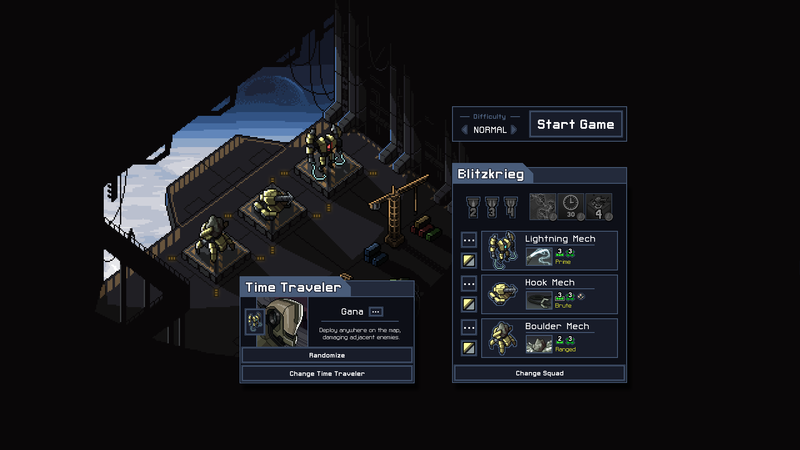 The FTL: Faster Than Light developers avoided the sophomore slump with their newest turn-based strategy title Into the Breach, which is just as original and addicting as its predecessor. Into the Breach is a strategist’s delight. The game is simplistic on the surface yet incredibly deep once you get into the meat of it. The player is tasked with defending cities on a flooded world. The last remnants of civilization remain on islands, and it is up to you to prevent the Vek from destroying them. The Vek are gigantic insect-like creatures, and to combat them you are armed with three mechs that have varying abilities. Combat takes place on various parts of the islands on eight-by-eight grids. You place your three mechs at the start of the battle and the Vek start to emerge from the ground. The game is turn-based, so after you place your squad, the Vek jump right into action. They can bind your units, rendering them immobile, or attack buildings. Buildings are part of the power grid, which acts as a health bar for the entire game. If enough buildings get destroyed, the power grid is destroyed and the Vek take over; your objective is less to kill the Vek and more to prevent them from destroying the buildings. If you can keep your power grid up long enough to progress from island to island, you can take the fight back to the Vek and finish the fight once and for all. Mechs are where the gameplay really shines in Into the Breach. Each mech is unique, and likewise they have differing abilities which complement and play off each other. Some mechs are hulking close-ranged units, whereas others are ranged. Though you start out with a single mech squad, you unlock more as you go. To do so, you have to get achievements which are then used as currency to unlock more squads. This is a unique and unorthodox way to incorporate progression into the game, but it works well – achievements require ingenuity and cunning to unlock, forcing you to think outside the box. You can also unlock pilots which give unique abilities to whichever mech they are in, allowing for a plethora of combinations. Each mech squad is well-thought out and unique. One team uses fire, enabling you to make most of the grid into a blazing inferno; conversely, another team can freeze enemies and push the frozen Vek around in blocks of ice. You have the choice to mix and match different units as well, which opens up a great deal of possibilities. The decision to create your own mech squads was a brilliant move on Subset Games’ part. Mechs can further be upgraded by equipping them with various weapons and passives. As you progress each island you will have objectives for a given level – fulfill those and they may add power to your grid or give you reputation with that island’s faction. Using reputation will enable you to buy new things for your mechs. Though, each new addition requires power, so you need to use power cores to upgrade your mechs further. Strategy is prevalent throughout the entire game, not just in its combat. Into the Breach incorporates this layer of strategy in such a way that each decision matters in and outside of battle but is not overly complex. Presentation of information is done extremely well in Into the Breach, which is vital in a strategy game. That said, while the game’s levels and types of enemies that appear at any given time are randomized to a degree, combat is not. Indicators on a level’s grid will tell you exactly where a Vek attacks, so you can be assured that it will happen unless you either kill them or move them out of the way. Likewise, a mech’s attacks will always hit. By mousing over the attack order near the top of the gameplay screen, you can see exactly the amount of damage both the enemy and you will make and receive. Environmental factors affect the battlefield even further. Each island has a unique biome, so one environment may have old landmines while others have vats of acid. Taking advantage of the environment is key. For instance, one level may have seismic activity, causing indicated tiles to fall off permanently. A smart player will take advantage of this, throwing a Vek onto one of those tiles, causing it to fall next turn. Sometimes a surface tile will rumble, indicating a Vek is coming through. You can either stand on it yourself, hurting your mech but preventing an enemy from emerging, or move an adjacent Vek on the tile, having the same effect. There are so many possibilities to every battle, and it can feel like a puzzle when determining what action you want to take. It’s so satisfying to have every little piece fall into place, allowing you to fight and live another day. The game equips you with every bit of information you need to succeed, but it can be a difficult one. On higher difficulties, one mistake could mean the difference between a dead Vek or a dead mech, or even the total destruction of the power grid, so thinking slowly and strategically is key. Thankfully, the developers offer an easy difficulty which still offers a bit of challenge, but also allows you to rake up achievements and ultimately beat the game. The hard difficulty, on the other hand, should challenge even the seasoned strategy vet. Luckily, all modes include a reset turn option that can be used once per battle, so if you misclick or make a terrible miscalculation, you have one more chance to succeed. The game also excels in its beautiful minimalistic sprite work. Subset Games’ art has a noticeable improvement here over FTL: Faster Than Light. The standout is the Vek, from the bulbous, blob-lobbing Crabs to the Lovecraftian Psions. Mousing over the Vek also shows a more detailed portrait, which is a nice little touch that helps you visualize what you are fighting with. The pilots, some humans and other robots, are also adequately rendered. Just as FTL: Faster Than Light excelled in its pixel-art, so too was it commended for its phenomenal soundtrack. Composer Ben Prunty is back once again to deliver another fantastic soundtrack with Into the Breach. It can be triumphant at one point and invoke a feel of urgency and helplessness at other times. Overtones of sci-fi are here and there, harkening back to Prunty’s roots. Into the Breach is an extremely polished game, so it is hard to find flaws in it. That said, the options menu leaves out a few important things. Though the game should run on anything better than a toaster, as of right now the game is locked at 60 FPS. I also wish they added the ability to adjust mouse sensibility, which was the first thing I looked for. The options menu does have other great additions, though, such as a colorblind mode and the ability to edit all the hotkeys. The game also lacks a major, driving narrative, which might be a turn-off to some. FTL: Faster than Light had story elements littered through random encounters. In a sense, you experienced a different story every time. This is not the case in Into the Breach. Dialogue is extremely brief, be it a quip from your pilot if you kill a Vek or a blurb from a faction leader. Even though the game excels without a fleshed-out narrative, it might be a deal breaker for fans of a good story. That aside, Into the Breach is another masterpiece by Subset Games. It is not flawless, but it is close. FTL: Faster than Light received numerous updates since its release in 2012. If Into the Breach gets the same treatment, it might rise above its predecessor’s fame. Austin Suther purchased his own copy of Into the Breach for the purposes of this review.